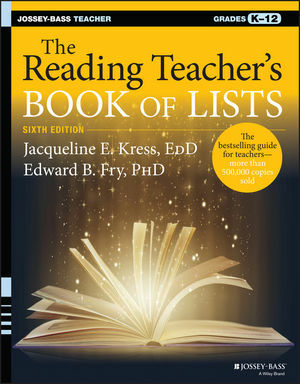 The Reading Teacher's Book of Lists is the definitive instructional resource for anyone who teaches reading or works in a K-12 English language arts-related field. Newly revised and ready for instant application, this top seller provides up-to-date reading, writing, and language content in more than 240 lists for developing targeted instruction, plus section briefs linking content to research-based teaching practices. This new sixth edition includes a guide that maps the lists to specific Common Core standards for easy lesson planning, and features fifty brand-new lists on: academic and domain-specific vocabulary, foundation skills, rhyming words, second language development, context clues, and more. This edition also includes an expanded writing section that covers registers, signal and transition words, and writers' craft. Brimming with practical examples, key words, teaching ideas, and activities that can be used as-is or adapted to students' needs, these lists are ready to differentiate instruction for an individual student, small-group, or planning multilevel instruction for your whole class. Reading is the center of all school curricula due to recent state and federal initiatives including rigorous standards and new assessments. This book allows to you skip years of curating content and dive right into the classroom armed with smart, relevant, and effective plans. It's more important than ever for students to have access to quality literacy instruction. Timely, up to date, and distinctively smart, The Reading Teacher's Book of Lists should be on every English language arts teacher's desk, librarian's shelf, literacy coach's resource list, and reading professor's radar. JACQUELINE E. KRESS, EDD, is a tenured Professor of Education at Georgian Court University's School of Education in Lakewood Township, New Jersey. She is the author of The ESL Teacher's Book of Lists from Jossey-Bass. EDWARD B. FRY, PHD, (19252010), was Professor Emeritus of Education at Rutgers University in New Brunswick, New Jersey. Internationally known for his Readability Graph, Fry was the author of more than 30 books.